LOWELL, MASS. 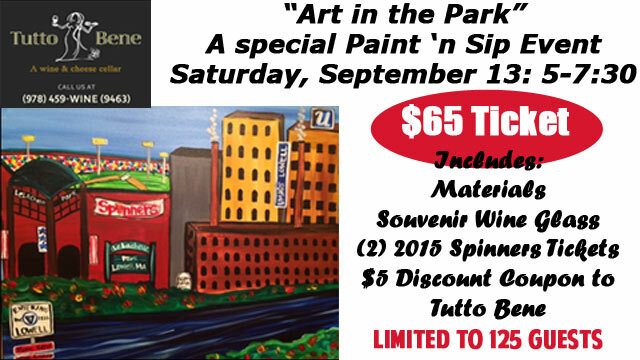 - The Lowell Spinners, Class A affiliate of the Boston Red Sox, announced Monday they have partnered with Tutto Bene of Lowell for a unique painting event to be held at LeLacheur Park the evening of Saturday, September 13. The event will feature painting and wine tasting on the concourse overlooking the ballpark, with instruction from professional artist Juliana on the Spinners' brand new high-definition video board. "We are thrilled to partner with Tutto Bene and bring this really unique event to the ballpark setting," said Spinners President and General Manager Tim Bawmann. "What better setting to create your own masterpiece while enjoying a beautiful night out." Admission to the event is limited to the first 125 guests to register for the event to ensure an optimal experience for all involved. Tickets, available now through www.tuttobenecellars.com/theartofwine or by phone at (978) 459-9463, are $65. That price includes the painting materials, a souvenir wine glass, two tickets to a 2015 Lowell Spinners game and a $5 discount coupon for Tutto Bene. "I cannot wait to see the creations by our artists at the event," said Bawmann. "From those who have never picked up a brush to returning painters, the final results should be amazing!" A portion of the proceeds from the event will benefit the Spinners Heroes Among Us program, which honors members of the Armed Forces. The event will take place from 5-7:30pm, with the painting starting shortly after the gates open. A cash bar will be available at the first time event. For more information or to order tickets, contact Tutto Bene at (978) 459-9463 or the Spinners Box Office at (978) 459-1702.